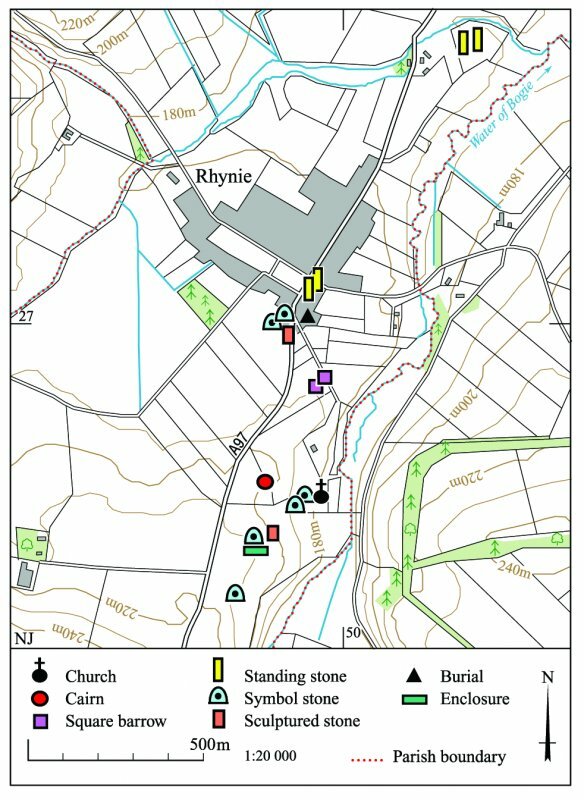 This map shows the location of sites and monuments around the village of Rhynie. View of two standing stones. 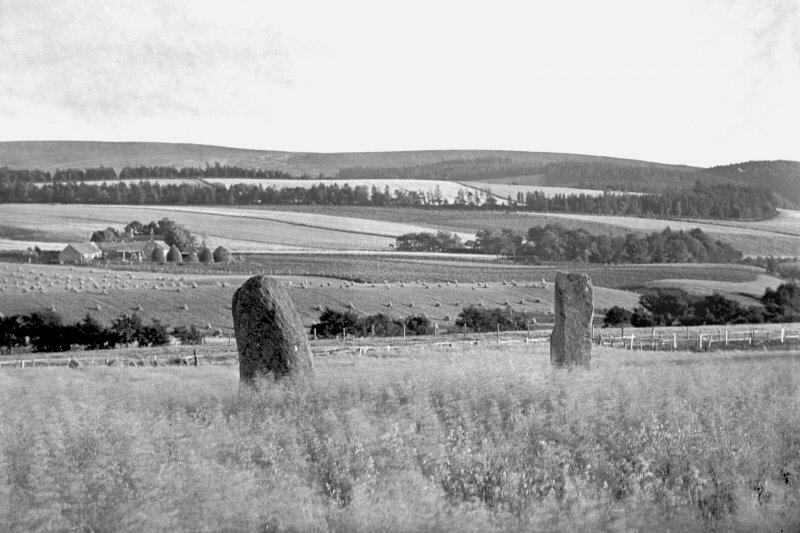 Original negative captioned 'Remains of Stone Circle at Mill of Noth, Rhynie. Sept 1905'. (NJ 5033 2779) Standing Stones (NR). Two standing stones, aligned E-W, which Coles (1902) suggests once flanked the recumbent stone, about 9 feet long, of a recumbent stone circle. One stone is 6 feet in height and the other 5 feet 9 inches and both, according to the ONB (1886), are 1 1/2 feet broad. Name Book 1886; F R Coles 1902. Two standing stones, as described. 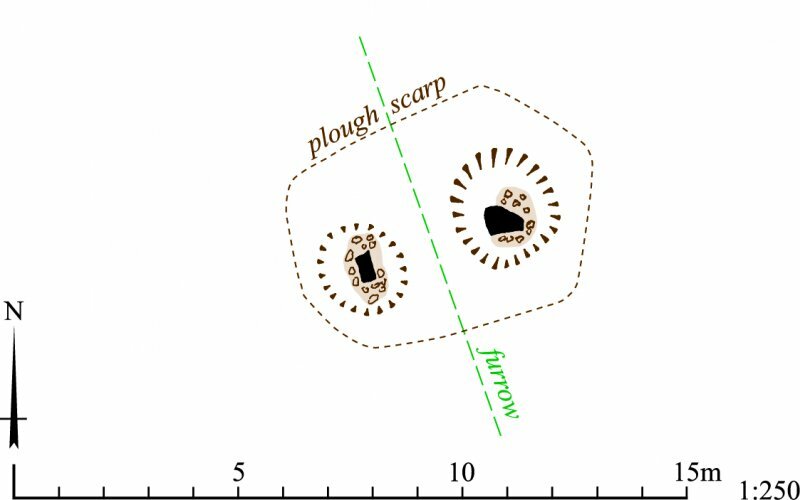 The orientation of these stones makes it impossible for them to have been on the SW arc of a circle and, therefore, unlikely to be 'flankers' of a recumbent stone circle. Visited by OS (RL) 20 September 1967. (Name cited as Mill o' Noth). This pair of standing stones is situated on a gravel terrace on the S side of the Burn of Easaiche, 100m ENE of Mill of Noth farmsteading (NJ52NW 51). The stones stand 2.7m apart and are set on an axis aligned roughly E and W. The E stone measures 0.7m by 0.5m at ground level and 1.95m in height. The W stone measures 0.67m by 0.34m and is also 1.95m in height. Visited by RCAHMS (JRS, IF), 5 March 1996. Scheduled as Mill of Noth, standing stones. Information from Historic Scotland, scheduling document dated 4 March 2002. This pair of stones stands on a terrace on the south side of the Burn of Easaiche 100m east-north-east of Mill of Noth. Set 2.7m apart, they are both 1.95m high, but whereas the eastern adopts the general axis of the pair, which lies east-north-east and west-south-west, the rather thinner western slab is set at right-angles to it. The OS surveyors who plotted the stones in 1866 (Aberdeenshire 1870, xliii) noted that local tradition ‘assigns these stones to be the remains of a Druidical place of worship’ (Aberdeenshire, No. 78, p 146), but it is Coles who first suggested that they had formed part of a stone circle. More specifically, he thought they were the flankers of a recumbent setting from which the recumbent had been removed, but for no other reason than that they were ‘shapely Pillars’ (1902, 565). 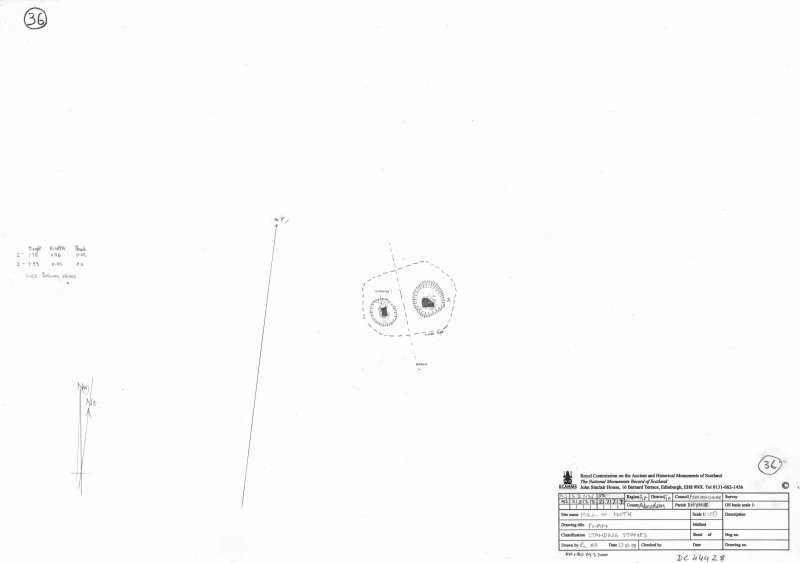 Burl was evidently not convinced and they do not appear in his lists of stone circles, but Barnatt has included them as a possible example of a recumbent stone circle (1989, 463, no. 6:144). The flat, low-lying location, however, would be unusual for a recumbent stone circle, and the way the western member of the pair is turned at right angles to its neighbour is also very rare in a recumbent setting, recorded only at Hill of Fiddes, Netherton of Logie, Strichen House and Tomnaverie, and certainly at the last two it is the result of an incorrect reconstruction. This feature is sometimes found in other pairs of standing stones, such as at Castle Fraser (NJ71SW 4).